Since December, Bitcoin’s price dropped 69 % from a high of $19,224 to a low of $5,920 in early February. The last time Bitcoin’s price plummeted this much was after the 2013 rally when it reached $1,000 per coin for the first time. During a 411-day correction, Bitcoin’s price dropped 87% from $1,163 on November 30, 2013 to $152 on January 14, 2015. 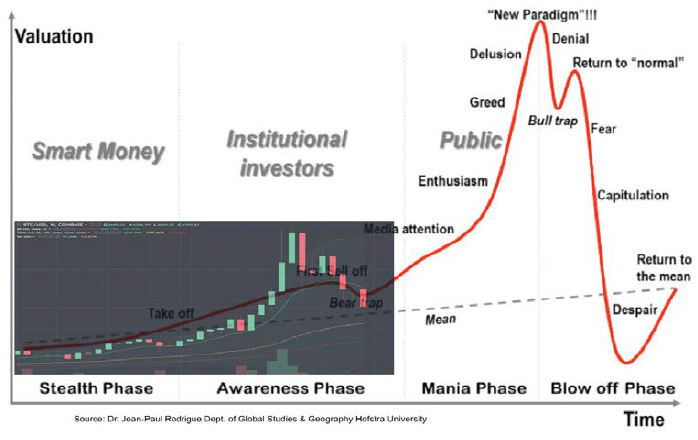 The general narrative in the media is that the current downward spiral is the bursting of the bubble; however, the fundamentals of the technology have not changed since December. This article explains what a bubble is, why some senior market analysts believe that Bitcoin is a bubble, and why they may be right if Bitcoin does not become widely adopted as a store of value or medium of exchange. Prior to the 20th century, bubbles were few and far between. The Dutch tulip mania in the 1630s, the British South Sea Bubble of the 1710s, and the French Mississippi Company of the 1710s are the most commonly cited examples of early bubbles. In recent times, the term “bubble” has been applied to collapses of several financial asset classes, including the 1930s stock market crash, the 1980s Japanese real estate market deflation, the 1990s Asian financial market collapse, the Internet stock bubble, and the 2000s housing crisis, amongst others. The commonly used definition of a bubble is “a surge in asset prices unwarranted by the fundamentals of the asset” and an “eventually burst, causing prices to precipitously decline before stabilizing at more reasonable levels”. For a familiar reference point, large tech-company stocks shrank up to 86 %, while other companies went out of business entirely during the “Internet bubble”. 1. The greater fool theory follows from Keynes’ beauty contest interpretation of stock markets. Overly optimistic investors by overvalued assets hoping to sell them to even more overly optimistic investors in order to generate profit. The party comes to an end, when the greatest fool is left with no one to sell the overvalued asset to. The greatest fool takes the greatest loss as the financialcvalue of the asset contracts. 2. The herd mentality follows from the investment wisdom that the best predictor of tomorrow’s price is today’s price. If cryptocurrencies are following an uptrend, and have for several years, why should the trend reverse tomorrow? However, as all financial market participants eventually learn, what goes up must go down. When enough investors begin to believe that the fundamentals of the asset do not justify the price, the bubble deflates and investors who bought in at the top, burden the loss. A burgeoning body of academic literature has developed around the topic of causes, impacts, and indicators of bubbles. Sociologists and behavioral economists have proposed several explanations for bubbles, including the greater fool theory and herd mentality. Economic theory holds that bubbles are a recurrent and damaging feature of our financial system; however, a quantitative test for determining if an asset’s price is a bubble does not exist. According to economist Dr. Jean-Paul Rodrigue, a bubble has four phases beginning with an increase in the value of an asset. Smart investors who understand the value of the technology begin building positions. In the second phase, institutional money enters the market, and the smart money investors reinforce their positions. In the third phase, the media gets involved, and everyone starts to say that the latest guests to the party are “unsophisticated”. At this point, the smart investors and institutional investors cash out and realize their gains. The final phase is marked by a collapse in the asset’s price because investors lose confidence in the fundamentals of the asset. Rodrigue’s theory is similar to the Dow theory which is the basis of technical analysis. Even though this description is strongly simplified, it may serve as a guideline for the evolution of a typical financial bubble. Institutional money has not moved into cryptocurrencies yet. Therefore, one could argue the cryptocurrency market is either still in the smart investor phase or the cryptocurrency market skipped the institutional investor phase and is the second bull trap. Source: Dr. Jean-Paul Rodrigue. 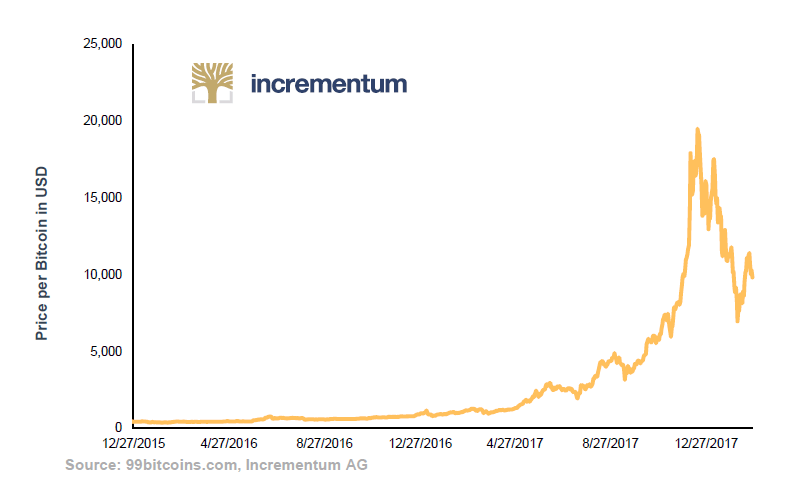 Increasingly used as synonym for tulips and the tulip mania of the 1630s, Bitcoin’s long-term sustainability is garnering serious doubts. The CEO of J.P. Morgan Chase, Jamie Dimon, called Bitcoin a fraud when Bitcoin reached $4,000 in September of last year. Recently, Paul Krugman claimed that Bitcoin is a larger bubble than the 2008 housing crisis. The 100,000 percent increase in Bitcoin’s value over the past five years is considered to be unwarranted exuberance because of five main reasons. In 2017, Bitcoin’s price rose from approximately $1,000 to $20,000. 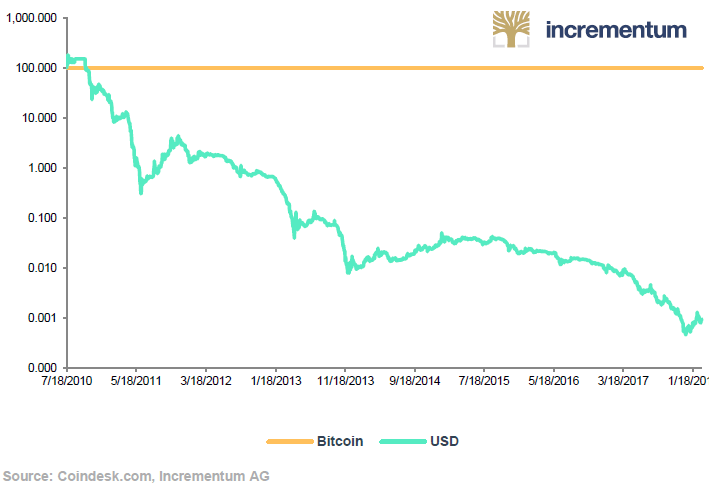 However, Bitcoin’s performance over the past three months looks like a deflating bubble. Economists Eng-Tuck Cheah and John Fry analyzed empirical data on Bitcoin’s price fluctuations and found that a bubble could explain 48.7% of Bitcoin’s price movement. Similar results were found by MacDonell (2014) and Garcia et al. (2014). The following chart shows the most recent price collapse that has revitalized the bubble argument on social media. Bitcoin’s original purpose was to be a medium of exchange unbacked by government. However, critics claim that a new monetary system cannot be created out of thin air by a few cryptographers in Palo Alto. This argument consists of two main parts: first, Bitcoin does not have any use case outside of being a medium of exchange; second, Bitcoin is not a tangible commodity. The proponents of the first argument claim that fiat currencies such as the U.S. dollar and the euro have value because the government backs them and because you can pay your taxes in them. Similarly, gold has value because it can be used in industrial applications. Following this logic, Bitcoin has no value because it cannot be used to pay taxes in most jurisdictions and it has no physical applications. The second argument follows from Austrian Economics and Ludwig von Mises’ regression theorem. The regression theorem states that the purchasing power of fiat today can be traced back to purchasing power of fiat yesterday which can eventually be traced back to when fiat was convertible for gold and other commodities. Bitcoin’s original purpose was to be an electronic cash system. Critics claim that Bitcoin is too volatile to be a store of value or a unit of account, and therefore, Bitcoin is a bubble. Volatility is generally measured by calculating the standard deviation of the asset’s return. The Bitcoin Volatility Index tracks Bitcoin’s price fluctuations. 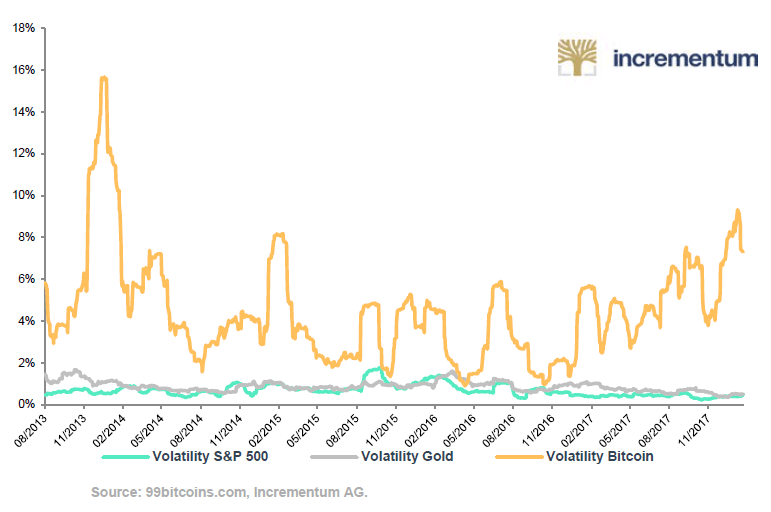 As shown in the next chart, Bitcoin’s rolling 30-day volatility has been over 6 % during the past month. At the same time gold and the S&P 500’s rolling 30-day volatility was 1 %. More volatility means more risk. According to this statistic, Bitcoin is a significantly riskier asset than gold or the S&P 500. Bitcoin has a 30 % correction every quarter, while the S&P 500 has had 12 corrections of 30 % or higher since its inception in 1929. The main point is that Bitcoin’s volatility makes it poor money, and if it is poor money, then why does it have value? Another prominent reason why Bitcoin is called a bubble is because the supply of cryptocurrencies is unlimited. The open-source and digital nature of Bitcoin enables thousands of new cryptocurrencies to be created for free. As the Crypto Concepts chapter on software forks explains, 19 hard forks of Bitcoin were created, and some of them had an impact on Bitcoin’s price. In addition to hard forks, new tokens can be created on the Ethereum blockchain with only 66 lines of code, and all 66 lines of code can be copy-pasted from online sources. There are even YouTube tutorials on how to create new cryptocurrencies in under six minutes. In 2017, over 472 new cryptocurrencies were launched. According to this argument, the demand for cryptocurrencies is larger than the supply. However, since the demand is finite, and the supply is theoretically infinite, the bubble will eventually collapse, and investors will lose billions of dollars. Bitcoin has only been around since 2009, and the technology has evolved from being a free and fast payment system to an expensive and slow payment system. Critics of Bitcoin claim that if it does not implode because of other factors, Bitcoin will be replaced by a cryptocurrency with superior technological features. Specifically, Bitcoin will be replaced by a cryptocurrency that does not require billions of dollars in electricity and mining hardware per year. Also, post-blockchain technologies such as Hashgraph and IOTA are the talk of all blockchain conferences and meet-ups because they promise to solve the Bitcoin scaling problem. The smartest minds in the world are working on better blockchains because the reward for creating a cryptocurrency better than Bitcoin is astronomical. As fast cars replaced slow horse buggies and sleek iPhones replaced Nokia bricks, the adage goes that Bitcoin is a bubble because it will not be around forever. Bitcoin’s price rose by 1,900% in 2017. Over the past five years, Bitcoin had a 100,000% return on investment. Everyone is talking about the asset. Even the American singer Katy Perry sported cryptocurrency logos on her nails to show enthusiasm for what some investors call a new asset class. When people quit their day jobs to become investors in the asset. Investors are taking on debt to purchase the asset. “We’ve seen mortgages being taken out to buy bitcoin. … People do credit cards, equity lines." – Joseph Borg, President of the North American Securities Administrators Association. In the past 20 years, we have experienced the dot-com bubble, the housing bubble, and now stock and bond markets are close to their all-time highs. Some skeptics are calling the current economy the “Everything Bubble” because every asset class is hitting an all-time high. Around the world, markets have entered unchartered territory. In the U.S, the Dow Jones Industrial Average reached 26,000 for the first time in history. The Case-Shiller Real Estate Index is back at its 2006 high. In Europe, trillions of euros have been poured into corporate and government bonds that have negative yields, and the UBS Swiss Real Estate Bubble Index is the highest it has been since the 1989 real estate downturn. However, the increase in price of real estate, stocks, bonds (and cryptocurrencies) cannot be explained by a fundamental improvement in the economy. Former FED Chairman, Alan Greenspan, referred to the Dow’s 44 % increase since Trump’s election and the bond market as financial bubbles. Other critical analysts like Peter Schiff regularly point out that industrial nations do not have real productivity growth. While financial markets are roaring, the economy still seems to have severe problems. The increase in asset prices does not match a complimentary increase in economic activity; however, another variable is highly correlated: namely, the money supply. Throughout history, excess money has been present before every single bubble. What is Money and Why Is Excess Money a Bad Thing? Several economists have observed that excess money is the catalyst of unsustainable financial bubbles; however, economists do not even agree on the definition of “money”. Mainstream monetary theory suggests that money is a medium of exchange, a unit of account, and a store of value. In contrast, the Austrian school of economics holds that money’s main purpose is being a medium of exchange, while unit of account and store of value are secondary. We asked two economists for their definitions of money: Associate Professor of Economics at WU Vienna, Dr. Guido Schäfer, and Research Assistant Professor with the Free Market Institute at Texas Tech University, Dr. Robert Murphy. Schäfer: To serve as money, an object must fulfil the functions of a medium of exchange, a store of value, a unit of account and of legal tender. As of now, bitcoin fulfils these functions only to such limited degrees that I do not think it can be considered as money. exchange, while precious metals, jewels, and pearls were used as a store of value In early agrarian societies, cattle were primarily used as a medium of exchange while wealth was accumulated in salt. In Austrian School for Investors, Taghizadegan, et al. (2014), explain how African tribal chiefs hoarded ivory before European merchants began using it as a medium of exchange. Since the 1600s, gold has been kept in clearing houses and depositories as a store of value while paper certificates of deposit became the most marketable medium of exchange. In the current financial system, the supply of money is increased via credit expansion triggered by artificially low interest rates. Due to the architecture of fiat money systems, central banks are authorized to create money out of thin air. A large portion of the newly created money is channeled directly into financial assets, which raises the prices of those assets. Meanwhile, a small amount goes to entrepreneurs and small business owners who want to expand operations. In addition to indirectly raising the demand for financial assets by pumping newly printed money into financial markets, printing money debases the currency. Each newly printed dollar decreases the purchasing power of the other dollars circulating in the economy. When central banks create new money, they do not create new goods or services. Therefore, the new money can only be spent on the existing supply of goods and services. Since the demand for goods and services goes up and the supply is fixed, price inflation ensures. Due to the inflationary bias of the fiat money system the currencies are no good long-term store of value. Gold still is seen as a store of value. 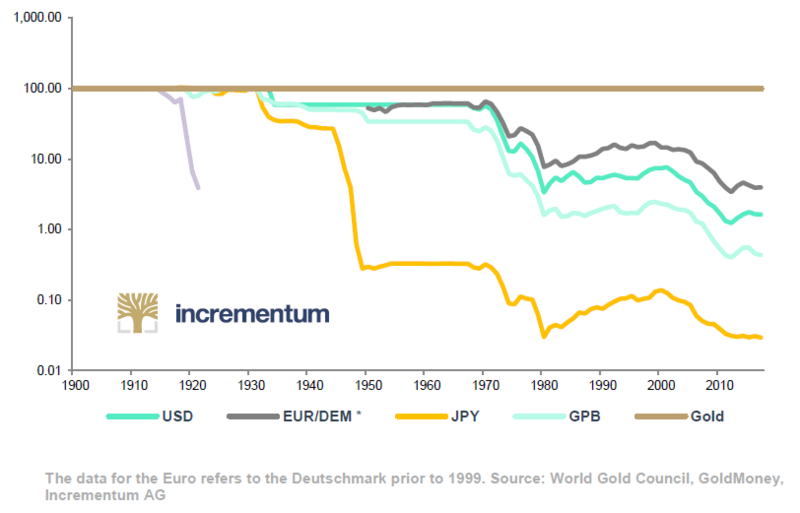 If one denominates paper-currencies in Gold one might get a different perspective of the long-termstability of fiat money. Under fiat monetary systems, average Joes and Janes can no longer store their money under the mattress for safekeeping. If they do, price inflation will eat away the purchasing power of their savings by 2 % to 7 % per year based on official and unofficial calculations, respectively. Permanent money debasement discourages saving and encourages consumption spending on cars, clothing, and vacations. People who are determined to save money are forced to take on additional risk to preserve the purchasing power of their savings over time. Instead of saving their money in bank accounts, savers are forced to look for other long term stores of values like stocks, bonds, and real estate. The main problem is that printing money is only a short-term strategy. If the purchasing power of a currency depreciates too quickly, demand for that currency decreases. In hyperinflations, demand for holding currency tends toward zero. Subsequently, the currency becomes worthless. However, increases in the money supply happen all the time. Harvard professors Kenneth Rogoff and Carmen Reinhart analyzed the past 800 years of our global financial history and found that governments always increase the money supply and that frequently governments print so much money that confidence in the money collapses. 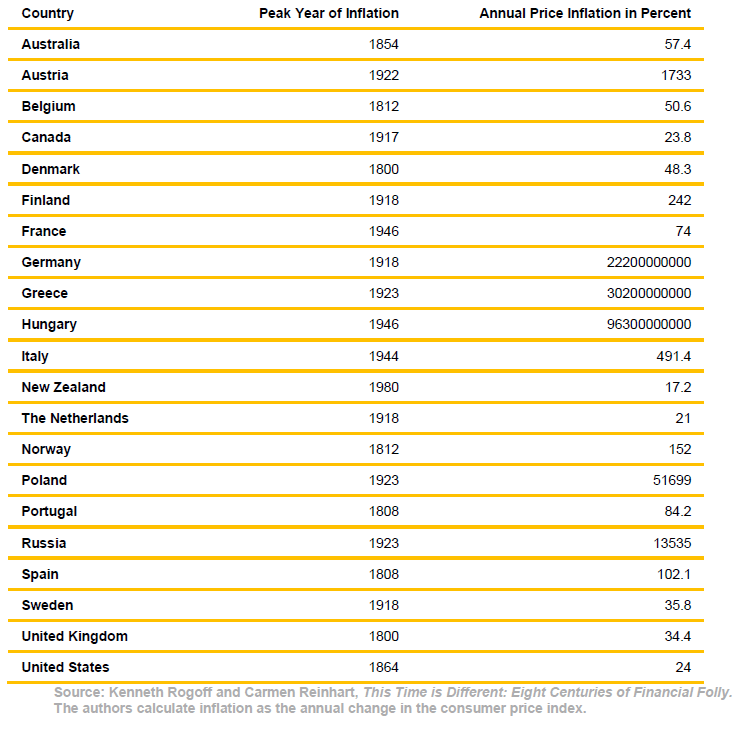 The following table shows 21 governments inflated their currency in Europe, Oceania, and North America between 1800 through 2008. In summary, newly created money from low interest rate policies and limited ways to save money have led to excess cash in the economy. The excess cash must go somewhere. Currently, the excess cash has found its way into stocks, bonds, real estate, collectables, and cryptocurrencies. Like all of the bubbles before, removing the excess cash will remove the bubble. If central banks raise interest rates too much, the nominal growth of financial markets will slow down or even decline. It is true that low interest policy and demand for a secure way to save are fueling part of Bitcoin’s rise in price. If central banks stop debasing the purchasing power of fiat currencies and people can return to the good old days of saving cash in their bank accounts, a large portion of Bitcoin’s appeal will vanish. In contrast, Bitcoin’s price will go much higher if fiat currencies continue to be a poor vehicle for saving. The number one reason Bitcoin may not be a bubble stems from Bitcoin’s technological qualities that make it a superior way of saving value. The upward price trend and speculation around Bitcoin stems from Bitcoin’s potential to be a global and permissionless system of managing wealth that cannot be confiscated. Like with Gold, one also gets a different perspective denominating the USD in Bitcoin. We would not expect the steep decline of the USD to continue, however the deflationary nature of Bitcoin would imply that it has more value relative to an ever inflating USD (or any other FIAT money). Also, the five reasons why analysts call Bitcoin a bubble can be countered. First, it is true that Bitcoin’s price fluctuates heavily; however, this does not mean that Bitcoin is not a good investment. To avoid buying at all-time highs, several investors invest a small amount of money in cryptocurrencies every month to gain exposure at an average price. This strategy is commonly referred to as cost averaging. Highly volatile assets have the advantage, that a small position of a portfolio has a reasonable impact on the overall performance. If sized correctly a saver/investor may be able to handle the volatility much better. The second argument that Bitcoin has no value because it has no use cases collapses upon closer inspection as well. The 19th century economist Carl Menger observed that value is subjective. Each individual values Bitcoin for a different reason. The market price is a surrogate of information concerning the individual preferences of consumers in society. If one Bitcoin costs $10,000, this means that a lot of people around the world value Bitcoin even though it is not a physical commodity. The third argument that Bitcoin is the most volatile asset class is also not evidence that investors should avoid Bitcoin. Many investors specifically target volatile asset classes with active trading strategies. Fourth, any analyst or economist that says the supply of cryptocurrencies is infinite does not fully understand the technology. Creating cryptocurrencies by copying and pasting code is free and can be used to increase the supply of cryptocurrencies. However, creating a new cryptocurrency does not mean it will have a network of users. Creating a network of users requires scarce resources such as capital and labor. Although the supply of cryptocurrencies is technically unlimited, the supply of global cryptocurrency networks is limited. The final point regarding Bitcoin being replaced by a better technology is probably the strongest argument against Bitcoin. However, Bitcoin is open-source, and many developers say that Bitcoin code change the underlying code to reflect consumer preferences. If another coin, such as Bitcoin Cash, begins to overtake Bitcoin, the original Bitcoin can adopt Bitcoin Cash’s features if necessary. Bitcoin was designed to fulfill three functions of money: store of value, medium of exchange, and unit of account. Bitcoin’s inherent scarcity removes the problem of excess money and currency debasement from the financial system. The total number of units is capped at 21 million and its inflation rate is more predictable than fiat or gold. Similar to Gold, Bitcoin allows Joes and Janes to save without having their savings diluted slowly by ever increasing money supply (or quickly in the case of hyperinflation). In both cases there may well be phases, where a saver has to be willing to lose nominal purchasing power for a longer period of time. However, Bitcoin does not only enable secure saving, this technology also allows people to directly send their savings to other people without converting into fiat or any other asset. The Bitcoin network does not depend on intermediaries. Stocks, bonds, real estate, and fine art, all depend on government stability and efficient courts that uphold legal contracts. Even owning gold was outlawed in the U.S. from 1933–1974. Today, it is only possible to move $10K worth of gold out of the U.S. at once. Given Bitcoin’s qualitative features, there are three possible outcomes for Bitcoin. Bitcoin’s qualities of durability, portability, fungibility, divisibility, scarcity, and non-confiscatability are attracting an injection of trust from users. The nominal and real price of Bitcoin in terms of the good and services that it can purchase is increasing because more and more people are demanding it. Since the quantity is fixed, all of the fluctuations in demand directly impact the price of Bitcoin. In contrast, investors are withdrawing trust from fiat currencies. In the U.S., quantitative easing 1,2, and 3 have resulted in over $12 trillion newly printed dollars. In January, the dollar index hit its lowest point since 1987 and its lowest exchange rate with the yuan since 1994. Velocity, or how often a currency is spent, is one way to estimate a currency’s value. Gresham’s law says that overvalued money flows into circulation while undervalued money is hoarded. Named after the 16th century financier Thomas Gresham, the law states that people hold on to money that is expected to retain its value and spend money that is expected to lose its value. Thus, inflationary money changes faster than deflationary money. 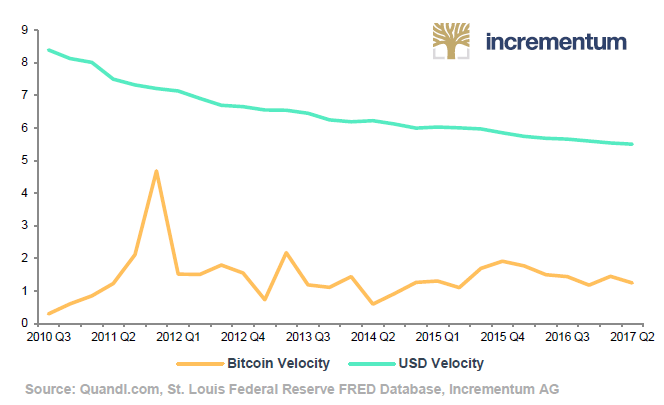 The next chart compares the velocity of the dollar and Bitcoin. In this graph, velocity of the dollar is the ratio of nominal GDP to the M1 money supply, velocity of Bitcoin is calculated as the ratio of Bitcoin’s transaction volume in USD to Bitcoin’s market capitalization in USD. When the media has negative reports concerning Bitcoin, such as China is outlawing ICOs or the electricity use is unsustainable, the perception that Bitcoin can become a global store of value is weakened, and the price drops. A crisis of confidence leads to investors pulling out their investments. Similarly, investors inject trust when there is good news about Bitcoin’s adoption such as the Lightning Network or CFTC Chairman Christopher Giancarlo’s positive comments about Bitcoin at the hearing on blockchain on February 6 of this year. If Bitcoin is adapted as store of value in the long term, the current period of volatility may be referred to as Bitcoin’s “hyperdeflation” phase, and this is the first time in history we are experiencing this type of economic phenomena. Investors are speculating whether or not Bitcoin will become digital gold, and rightly so. Due to the inflationary design of fiat money, Bitcoin exhibits interesting properties relative to fiat money as store of value. If Bitcoin achieves this goal, the price may level out and volatility could fall drastically. The original Bitcoin white paper written by Satoshi Nakamoto states that Bitcoin was intended to be an electronic cash system; however, many people believe that Bitcoin can never become global and permission less money. According to Dr. Schäfer (and several other experts), the authorities will crack down on the technology if people really started to use it. In addition to legal uncertainty, Bitcoin’s high transaction fees and network latency make it cumbersome to use as a medium of exchange. If one mistake in the receiver’s address is made, the Bitcoin are gone forever. If the Bitcoin are sent to an Ethereum address by accident, the Bitcoin are gone forever. If a coffee is bought with Bitcoin, the merchant has to wait at least ten minutes before they know if the payment was valid. If a transaction is sent in the wrong amount, there is no way to do a chargeback or file a dispute. Given the technological problems, the majority of Bitcoin users do not use it as a medium of exchange. Our current payment system is easier to use. We already have credit cards, banks, and PayPal to facilitate our payments to merchants around the world. On the other hand, technologies such as the Lightning Network and SegWit may eventually make Bitcoin a good medium of exchange as well. If Bitcoin can scale to become a global medium of exchange, its purchasing power will increase because it will be able to serve three distinct functions: storing value, transmitting value, and ultimately being a unit of account. We contacted two monetary economists, which have different views on this topic. The following table summarizes the views of the professors on why Bitcoin has value, and whether or not Bitcoin is a bubble. Bitcoin’s success so far has been nothing short of a miracle. Since Bitcoin’s inception in 2009, Bitcoin has been declared “dead” hundreds of times in the media. The Bitcoin network has several threats including hacking the SHA-256 encryption algorithm, being outlawed by governments, a 51 % attack, and solar flares bringing down the Internet. If Bitcoin fails to become a global store of value or medium of exchange, the value and subsequently the price of Bitcoin will fall. The Bitcoin revolution is about having a way to store and transmit value that does not depend on central bank monetary policy, capital controls, or property rights. The reason people pump their paychecks into real estate, bonds, and stocks is not because these assets make a better medium of exchange. These assets make a better store of value than fiat currency, and Bitcoin has the technological features to become an even better store of value than these assets. If Bitcoin manages to additionally achieve worldwide adoption as a medium of exchange, the price of Bitcoin will most probably have a spectacular return going forward. If Bitcoin fails, the price will collapse, and it will go down in history as one of the largest bubbles of all time. Eighteen years after the infamous highs of the tech-markets in the year 2000 most companies have embraced the opportunities of the Internet. Today, the Internet is definitely not referred to as a bubble. Similar to internet stocks, many of the cryptocurrencies may be gone in five years from now; however, the dream of a decentralized and private store of value has been born, and this will inspire an onslaught of technologies until the mission is complete. Diversification is a key component of building a portfolio that retains value in the long run. The major takeaway is that a little bit of gold, a little bit of cryptocurrencies, and a little bit of fiat may provide investors with a type of insurance against changes in the future. Future generations may use a combination of cryptocurrencies, commodities, and fiat currencies depending on which money serves their needs the best for each of their different goals. We want to sincerely thank Professor Dr. Guido Schäfer, Professor Dr. Robert Murphy, and Mark Valek for contributing to this chapter. Guido Schäfer is an associate professor of economics at WU Vienna. Robert P. Murphy is a research assistant professor with the Free Market Institute at Texas Tech University. He is also a senior fellow at the Mises Institute in Auburn, Alabama. 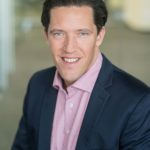 Mark Valek is a fund manager and research analyst at Incrementum AG. Bitcoin traded above $20,000 on some exchanges. Jim Edwards, “One of the kings of the ‘90s dot-com bubble now faces 20 years in prison,” Business Insider UK, Dec 6, 2016, http://www.businessinsider.com/where-are-the-kings-of-the-1990s-dot-com-bubble-bust-2016-12. Preston Teeter and Jörgen Sandberg, “Cracking the enigma of asset bubbles with narratives,” Strategic Organization 15, No. 1 (2017), http://journals.sagepub.com/doi/abs/10.1177/1476127016629880#articleCitationDownloadContainer. Jamie Dimon retracted his statement in an interview on Fox Business in early January, https://www.ft.com/content/e04e359a-e9e9-3f8e-8e2f-3f4373e5efb0. Jacqui Frank, Kara Chin and Joe Ciolli, “Paul Krugman: Bitcoin is a more obvious bubble than housing was,” Business Insider, Dec 15, 2017, http://uk.businessinsider.com/paul-krugman-says-bitcoin-is-a-bubble-2017-12?r=US&IR=T. Eng-Tuck Chea and John Fry, “Speculative Bubbles in Bitcoin markets? An empirical investigation into the fundamental value of Bitcoin,” Economic Letters 130 (May 2015), pp. 32–36, https://www.sciencedirect.com/science/article/pii/S0165176515000890. Ludwig von Mises, The Theory of Money and Credit (1912). Bitcoin Energy Consumption Index,” Digi Economist, 2018, https://digiconomist.net/bitcoin-energy-consumption. Rahim Taghizadegan, Ronald Schöferle and Mark Valek, Austrian School for Investors: Austrians Investing between Inflation and Deflation. Mises Institute, 2014. https://www.amazon.com/dp/B01D2A4Z7S/ref=dp-kindle-redirect?_encoding=UTF8&btkr=1. Jörg G. Hülsmann, The Ethics of Money Production. Mises Institute, 2008. People who are unwilling or unable to take on debt do not directly receive any of the “economic stimulus”. Kenneth Rogoff and Carmen Reinhart, This Time is Different. Princeton: Princeton University Press, 2009. Peter Schiff, „Ep. 324: Obama & Yellen Strand Trump & Powell in Dodge,“ YouTube, Jan 31, 2018, https://www.youtube.com/watch?v=4NN7n3ABYx4&feature=share. “Bitcoin Obituaries: Bitcoin has dies 259 times,” 99Bitcoins, 2018, https://99bitcoins.com/obituary-stats/. Mark Valek is partner of Incrementum AG and responsible for Portfolio Management and Research.